BunnSmoke Wows Crowd, Wins Trophy at The Houston Art Car Parade! Congratulations Conrad on a Bike Well Done! Chattanooga's first art bike received a lot of attention and smiles along the parade route yesterday. The smell of wood chips and shish kabobs filled the air as Conrad rolled his sculpture through the parade route in front of 300,000 spectators. The judges were impressed with his work, awarding him second place for the cycle category. 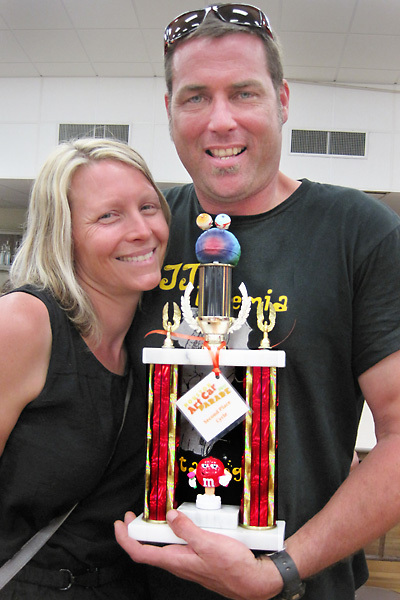 Conrad Tengler and his wife, Elizabeth, show off their coveted art car trophy.